As I planned here, I pooled the CmR colonies resulting from transformation with EMS-mutagenized CmR murE+ DNA, and grew them to log phase (OD600 ~ 0.1). The murE+ cells in the pool should have been non-competent under these conditions, but any murE* hypercompetenc mutants should have been competent. To select for these mutants I transformed the cells in each pool with DNA carrying a streptomycin-resistance mutation, and plated on Str plates. One pool gave several hundred StrR colonies (many more than I would have expected as transformants), but the other pools had very few or none (4 total). I then screened individual StrR colonies by mixing them with dilute NovR DNA and plating on Nov plates. Unfortunately none of the StrR colonies transformed to NovR at the high frequency seen for the positive control (murE749) colonies. 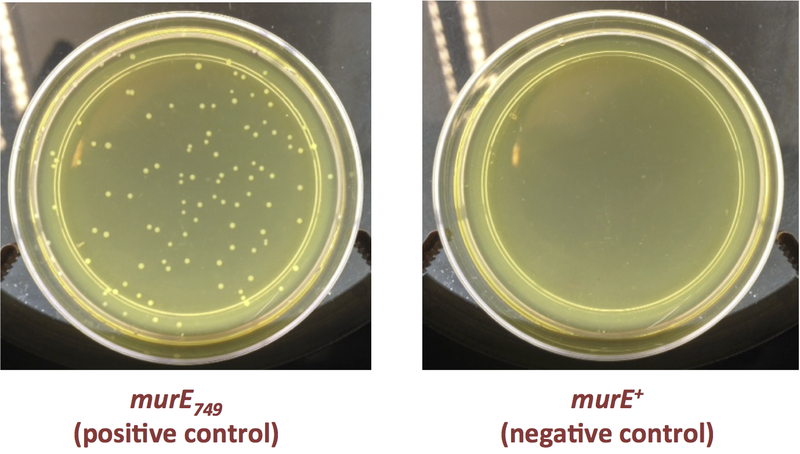 In fact, none transformed any better than the murE+ negative control colonies. This is a bit surprising, given that the 2-fold higher level of EMS mutagenesis reduced by 100-fold the ability of the CmR cassette to transform cells, and the 4-fold higher level eliminated it entirely. I had assumed that this reduction/elimination was due to too-heavy mutagenesis, but perhaps it was a direct consequence of the DNA damage. One possible explanation I'm considering is that damaged DNA is almost always repaired or destroyed, and rarely gives rise to recombinants. Another possibility is that, when cells are mutagenized, the mutations arise mainly only when levels of damage are so high as to overwhelm the repair systems, allowing the damaged bases to be used as templates for DNA replication. Maybe this also requires induction of the error-prone DNA polymerase. * Here's some wishful thinking: Ideally we should be selecting for a G->A transition mutation because those are what EMS induces best. But we're using novR (G->T) because we have the porimers handy and know they work. The mutation spectrum of EMS is reported to be much broader with the in vitro mutagenesis we're using, so we hope this will work. But I just checked the numbers and they didn't see ANY of the kind of change we'd need. Really we should use selection for streptomycin resistance, since its T->C mutation is a type that arose at high frequency with the in vitro EMS treatment. I wonder if we have the primers for this - I think the post-doc might have gotten them for us.